"Things Pass By" is a novelet by Murray Leinster first published in 1945. It is a very loose sequel to "The Eternal Now", sharing a concept and resultant invention, but taking place a generation or more later with no shared characters. Like the earlier story, "Things Pass By" reads as though it was plotted or even drafted a dozen or more years earlier in the pre-Tremaine, pre-Campbell era of science fiction, and in fact its plotting and characterization fall short of Leinster's own better work in the 1930s. 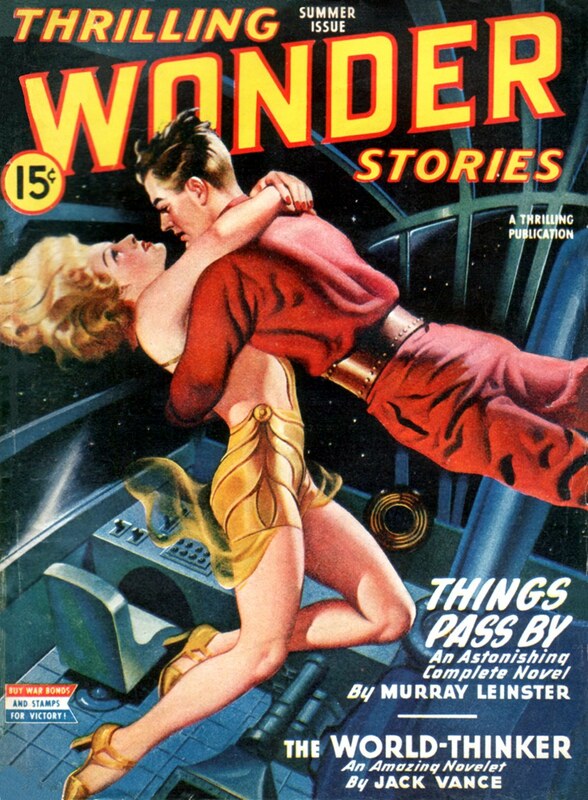 To sharpen the contrast, Leinster published nine stories in 1945, including his famous "First Contact", "The Ethical Equations", "The Power", and others in Astounding; and "De Profundis" in Thrilling Wonder Stories. "First Contact", like Leinster's classic "Sidewise in Time" in Astounding back in 1934, created a new school of thought and stories. The first of the cosmoquakes was relatively mild. The earth's atmosphere went crazy, and the sun's photosphere burst into frenzied eruption. There were casualties here and there, and earthquakes of varying intensity followed it. Possibly a thousand people, altogether, died as a result of the first cosmoquake. But it was really very mild indeed. "I'm really a sort of psychologist, you know. My specialty is the mechanics of research. But I test my theories about how to make discoveries by using them to make discoveries." This mutual enlightenment of philosophical and scientific discovery is the subject of David Harriman's The Logical Leap: Induction in Physics — reviewed and critiqued by William H. Stoddard at Troynovant. Now back to the cosmoquakes. What causes them is the arrival of outriders or scouts of a large formation of objects approaching the Solar System at extremely high speed, and hence possessing Einsteinian mass of appropriately high order — in this case, each object masses about twelve sols, or twelve times the mass of our Sun. This of course is a disaster of astronomical magnitude, a Doomsday scenario. In "Things Pass By" we take for granted the Einsteinian "obverse" spacetime theory and its associated invention, the mass-nullifier developed decades earlier in "The Eternal Now". Adapting this to power a spaceship, Braddick heads out to attempt to neutralize the super-sol approaching entities. Leinster's solution is dramatic but thinly developed; and seems a stretch, to put it kindly. Leinster's major failing here, though, is that his visualization of the damage to the Earth is merely on the order of the planetary gravity in Philip Wylie and Edwin Balmer's When Worlds Collide (1933). Even though Leinster includes gravitational effects upon our Sun, the tidal damage actually required by his setup, even from the first super-sol "scout" passing by so closely, should destabilize our Sun altogether, resulting in a Solar Doomsday in which cosmoquakes and what-not would be "really very mild indeed", because the Sun would explode and the planets vaporized about as soon as any quakes occurred. Fortunately for the world, even Leinster's very bright characters are unaware of any imaginative implausibilities. In Leinster's characterizations, however, we see that Braddick's spaceship construction and journey to deal with the on-rushing super-sols shows the reader some interesting people. The heroine, rather unusually for a Leinster story, brings considerable scientific training and initiative of her own to the action. And she still has some time for romantic thoughts. The two bad guys the hero has forced upon his project as the spaceship is built are well differentiated, one being a nasty organization-climber and the other a make-no-waves technician. Fifteen years later, Murray Leinster returned to the approaching super-sols challenge at novel length in The Wailing Asteroid (1960), a far more plausible and engaging work. But you can see its roots in "Things Pass By".